Top Moments (#30 - #26) of the 2014-2015 Kansas City Royals. This set of five Moments include a pair of bases-clearing two-out doubles, a bases-clearing one-out double which all but clinched a championship, a controversial home run that may or may not have been aided by a Royals fan, and – objectively speaking – the most pivotal out of the last two years. And we still have 25 Moments to go. Summary: Alex Gordon clears the bases with a 1st-inning two-out double, giving the Royals the lead on their way to sweeping the Angels out of the ALDS. The Royals led the 2014 ALDS 2 games to 0, but things can change quickly in a best-of-five series, and a single Angels victory would turn Game 4 into a near must-win game or face the specter of returning to Anaheim for a winner-take-all Game 5. And unlike the first two games, the Angels scored first in Game 3, when Mike Trout – who the Royals had handled beautifully all series – homered off of James Shields in the top of the 1st. But with one out in the bottom of the 1st, Nori Aoki and Lorenzo Cain singled with one out, and after Hosmer struck out on three pitches against C.J. Wilson, Billy Butler walked on four pitches to load the bases. So Alex Gordon stepped in with the bases loaded and two outs, and on a 2-2 pitch Wilson threw an 83 mph slider down and away, except he didn’t get it down enough, and Gordon drove the pitch off the base of the wall in left-center field, clearing the bases. Butler chugged around all the way from first base – another smart read by Mike Jirschele – and slid stylishly into home just ahead of throw, pumping his fist as he got to his feet. The Royals had a lead they would not relinquish on their way to winning Game 3 and the series. How big a hit was it? It was the first hit to drive in three runners in a playoff game since Jim Sundberg’s bases-clearing triple in Toronto in Game 7 of the 1985 ALCS. Top Moments (#35 - #31) of the 2014-2015 Kansas City Royals. This set of five Moments include a pair of run-scoring doubles with no outs and the Royals down 2-0 in the last game of the World Series, and while the first one proved to be insufficient, the second one made all the difference; the tying and go-ahead hits against David Price in the most pivotal inning of the 2015 ALCS; and one of only two walkoff wins in the last two postseasons. And we still have 30 Moments to go. Summary: After Matt Harvey lobbies his manager to stay in to pitch the 9th inning, Eric Hosmer makes him pay. I’m very curious to see the reception that Matt Harvey gets at Kauffman Stadium on Opening Night. The natural inclination is to boo, I know, but shouldn’t we be cheering the guy who, through sheer force of stubbornness, coerced his manager into opening the door for the Royals to mount a game-tying rally in the 9th inning? Harvey had already walked Lorenzo Cain on seven pitches to start the 9th, and still Terry Collins stuck with him. On the first pitch to Eric Hosmer, Cain stole second base. And on the second pitch, Harvey’s 111th and final pitch in the final game of the 111th World Series, he threw a 94 mph fastball that tailed away, and Hosmer did a masterful job of slicing the ball deep to left field, over Michael Conforto’s head and off the wall for an RBI double. And then, finally, Collins called upon Jeurys Familia. What’s striking about the video is the fear you can hear in the crowd after the double. Sure, the Royals had just scored a run, and the tying run was on second base with no outs – but the Mets still had the lead, and home field advantage. But you can sense the crowd’s reaction already starting to turn: here we go again. And the best part? The crowd was right. Damn it was fun rooting for these guys. Top Moments (#40 - #36) of the 2014-2015 Kansas City Royals. This set of five Moments includes the season-saving final hit in a player’s 11-year major league career, a pair of tie-breaking singles in key situations, a potential out at the plate kicked away which led to the only two runs the Royals would score in a playoff win, and a Mets player’s brain-lock TOOTBLAN that led to the final out in a World Series game. And we still have 35 Moments to go. Summary: With the Royals three outs away from elimination, Josh Willingham pinch-hits against Sean Doolittle and delivers the final base hit of his career. If Ben Zobrist was the best trade deadline acquisition in Royals history, and Johnny Cueto was the second-best trade acquisition in Royals history, then who was the best trade deadline acquisition prior to 2015? It might have been Jason Frasor in 2014, who stabilized the middle relief corps down the stretch and then allowed one run in 5.1 innings in the playoffs. Or it might have been Josh Willingham, who only hit .233/.349/.384 in 86 plate appearances as a Royal, and had just one hit in the postseason. But oh, what a hit it was. Willingham led off the bottom of the 9th in the Wild Card Game, the Royals down a run with three outs left in their season, against Sean Doolittle, who had a respectable 2.73 ERA during the regular season, but whose ERA vastly understated his dominance – he had a 1.71 FIP, thanks to a strikeout-to-walk ratio of 89 to 7. (Among closers with 15+ saves in a season, Doolittle’s strikeout-to-walk ratio ranks fifth all time, behind two seasons from Dennis Eckersley, one from Mariano Rivera, and Koji Uehara’s insane 2013 season.) Batters had hit .169/.197/.262 off Doolittle during the season. Willingham, meanwhile, hadn’t had a base hit since September 10th. It didn’t look like a good matchup for anyone to face Doolittle, and it didn’t look any better when Willingham swung through Doolittle’s first pitch, or when he fell behind 1-and-2. But then, just as Ron Darling was claiming on the broadcast that the “Royals got Willingham to do one thing – hit the ball out of the ballpark”, Willingham swung at Doolittle’s fourth pitch, a 94 mph fastball that got a little too much of the outside part of the plate, and blooped it (Team Contact!) down the right field line. The A’s, who certainly respected Willingham’s ability to hit the ball out of the ballpark, had their outfield slightly shaded to the pull side, and rightfielder Josh Reddick had no chance to catch Willingham’s blooper. One inning after the Royals stranded the tying and go-ahead runs in scoring position with one out, they had another rally going. And they had one more pinch-running weapon in their holster. Willingham would then retire after the season, making this single the final base hit of his career. I’m sure that, in the grand and glorious history of major league baseball, there are other players who have made the final hit of their careers count for more. It’s just that I don’t know who they might be. Willingham was a Royal for barely two months. He had 18 hits in a Royals uniform, and 17 of them are completely unmemorable. And he’ll never be forgotten. Oh, and why was Willingham in the game at all? He was pinch-hitting for Mike Moustakas. Ned Yost abhors pinch-hitters as much as any manager I’ve ever seen, but even he understood that when a left-handed hitter who batted .212 on the season, and who hit .172/.241/.313, is scheduled to face a left-handed closer in the 9th with your season on the line, you need to look for another option. Willingham was on the roster for basically this situation, and Yost used him. Had Moustakas had the year he had in 2015 in 2014 instead, he’s not coming out of the game, and everything turns out differently. Everything happens for a reason. What makes the 2014-2015 Royals so special is that the reasons are all laid out for us, clear as day. Top Moments (#45 - #41) of the 2014-2015 Kansas City Royals. This set of five Moments includes arguably the most underrated hit in either postseason, two remarkable and emotion-fueled innings from a kid less than four months out of college, and two singles in the thick of the Miracle at Minute Maid. And we still have 40 Moments left to go. Summary: Ben Zobrist singles to put the winning run on third base with no outs in the bottom of the 14th inning. Ben Zobrist is on pace to be one of the great trade deadline acquisitions of all time. Baseball has something called the “Esurance MLB Awards”, which I’m sure is totally a prestigious award and not something they invented just to get money from a corporate sponsor. One of these awards is for “Best Major Leaguer, Postseason”, which you and I would call the Postseason MVP. In 2015, it was awarded to Wade Davis, and I’m not about to tell you that was a mistake – Davis threw 10.2 scoreless innings in the playoffs, the Royals won all eight games he appeared in, and he recorded four saves along with a win in Game 6 of the ALCS in one of the gutsiest relief outings you’ll ever see. His WPA was 0.949, so he was worth about a full win above an average (not replacement) pitcher in just eight games – such is the impact of pitching high-leverage innings. The two other finalists were Daniel Murphy, which is understandable, and Alcides Escobar, who was the ALCS MVP and hit .329/.347/.514 in the postseason. Escobar’s WPA in the 2015 playoffs was only 0.078, though – he was barely average when you consider the context of his at-bats, which is to say he did some of his best work in games that weren’t particularly close. (In Games 3 and 4 of the ALCS, for instance, he was 6-for-8 with a triple.) But I would submit that the player who had the best case for challenging Wade Davis for the award was Ben Zobrist. Zobrist hit .303/.365/.515 in the playoffs, with a WPA of 0.392 – not nearly in Davis’ class, because everyday hitters, unlike relievers, can’t be saved for the highest-leverage moments. But he always seemed to come through with exactly what the Royals needed, whether it was a sacrifice fly to drive home an insurance run (Moment #115) or a walk to start an 8th-inning rally (Moment #104) or a home run to open the scoring (Moment #119 and Moment #85) or a go-ahead single in the 7th inning (Moment #55). Or his biggest Moment of all, and in classic Zobrist fashion, one that is so overlooked that MLB.com doesn’t even have a highlight for it: with Alcides Escobar on first base after David Wright’s error to start the bottom of the 14th, Zobrist took advantage of Lucas Duda holding Escobar on first base to create a huge hole on the right side of the infield, and punched a single through the vacated space, allowing Escobar to go first-to-third and put the winning run 90 feet away with no one out. The WPA of this play (+23%) was not only the largest of the game, it was the fourth-largest by any Royals hitter in the 2015 postseason, and two of the three bigger plays were actually errors by the opponent. Eric Hosmer gets all the glory for his sacrifice fly two batters later, but Zobrist was more responsible than anyone else for the game-winning rally. Was Zobrist the MVP of the postseason? I’m not sure, but I wouldn’t write off his case. WPA doesn’t take position into account, and getting that kind of offensive production from second base is even more valuable. It also doesn’t factor in defense, and while Zobrist didn’t make any spectacular plays during the playoffs, he also didn’t make any errors, which isn’t an insignificant fact over the course of 16 games. As an aside: Hosmer hit .212/.236/.288 in the 2015 postseason…and his WPA was 0.812 anyway, because his hits were so timely. That doesn’t account for his costly error in Game 1 of the World Series – and gives him credit for Daniel Murphy’s error in Game 4 – but it also doesn’t account for his mad dash to score the tying run in Game 5. Top Moments (#50 - #46) of the 2014-2015 Kansas City Royals. There’s so much awesomeness in the Top 50 that going forward, I’ll be posting articles five Moments at a time instead of ten so that you can savor them all the more. In this batch alone we have the most dominant inning in Royals postseason history, two improbable RBI singles from Eric Hosmer, a leadoff single in extra innings in the final game of the year, and the moment the Royals won their first pennant in 29 years. And we still have 45 Moments to go. Summary: With Game 1 of the 2014 ALCS tied in the bottom of the 9th, after the Royals had blown a golden opportunity to take the lead, Wade Davis throws the most dominant inning in Royals playoff history. We start the Top 50 with a Moment that you almost certainly have forgotten about. That’s because I cheated a little; this isn’t a single moment as it was a single inning. A dominant, hellacious, series-changing inning. To set the stage: Game 1 of the 2014 ALCS was tied at 5 entering the ninth inning. The Orioles turned to their closer, Zach Britton, who proceeded to do the unthinkable: he walked the bases loaded. First he walked Alcides Escobar on a 3-2 count, which is difficult enough on its own. But Britton then faced Jarrod Dyson, who can’t hit lefties worth a damn, and had entered the game as a pinch-runner for Nori Aoki in the 7th (and then was thrown out trying to steal second base) – on four pitches. Britton then walked Lorenzo Cain – on four pitches. The bases were loaded, there were no outs, the heart of the Royals’ order was due up, and the pitcher on the mound suddenly couldn’t throw strikes. You might even say that the Royals had…momentum. And then Zach Britton, on a 3-2 pitch to Eric Hosmer, got Hosmer to ground out to the first baseman – who, with the infield in, threw home and got the force out to keep the game tied. That brought up Billy Butler, and Buck Showalter called on Darren O'Day - like Britton a groundballer, but who also had the benefit of being right-handed - to face off against one of the game’s biggest GIDP threats. Sure enough, on the 7th pitch of the at-bat, Butler rolled over to the shortstop, who started an easy 6-4-3 double play. Butler’s double play had a WPA of -35%, making it by the far the most damaging plate appearance by a Royals hitter in postseason history. (No other play is even at -20% WPA.) After having the bases loaded with no outs, the Royals didn’t score, and the Orioles would bat in the bottom of the 9th with their 2-3-4 hitters due up, needing single run to end the game. You would definitely say that the Orioles had…momentum. It was Earl Weaver who said “Momentum is the next day’s starting pitcher”, because Earl Weaver was a very smart man. I have proposed a 21st-century corollary to this rule that applies to momentum within games: Momentum is the next inning’s reliever. And in the history of baseball, there has never been a better reliever to call upon in the next inning than 2014-2015 vintage Wade Davis. Davis had already pitched the 8th inning, but having dispatched the Orioles on just seven pitches, and with the game tied and poised to continue indefinitely, it made sense to try to milk another inning out of him. And oh, what an inning it was. Pitching through a steady rain, Davis struck out Alejandro de Aza on four pitches. He then struck out Adam Jones on three pitches. And finally, as you see here, he struck out Nelson Cruz on four pitches. I unfortunately do not know a way to check this for sure, but I’m fairly certain that there has never been another instance in the playoffs of a Royals pitcher striking out the side on 11 pitches or less. So I think it’s safe to say that this was the most dominant inning in Royals playoff history. (Update: the above paragraph is dead wrong, as brilliant reader Taylor Witt pointed out in the comments, and I am an idiot for forgetting. In Game 5 of the 1985 World Series, Danny Jackson - on his way to a complete game win, the second time that October that he threw a complete game victory in a Game 5 with the Royals down 3 games to 1 - struck out the side in the 7th inning on nine pitches. That's right: Danny Jackson threw an Immaculate Inning in the World Series. He is the only pitcher to ever thrown an Immaculate Inning in the postseason. And the reason I'm an idiot for forgetting is that Bill James wrote about this in his "A History Of Being A Kansas City Baseball Fan" essay in the 1986 Bill James Abstract, which I've only read about a dozen times. Here I quote: "Jackson was never challenged again. In the seventh inning, Brett slid into the dugout in a spectacular, but unsuccessful, attempt to catch a pop up; that failing it became strike one, and Jackson struck out the side on nine pitches. (I wonder if that's ever happened before in a World Series game? I'd be very surprised if it has.) 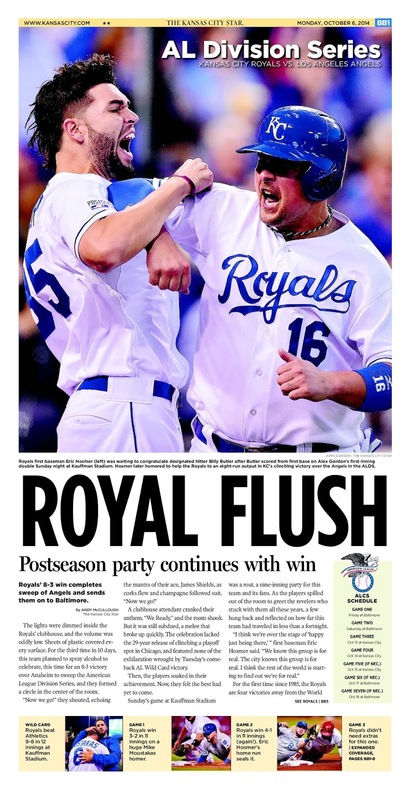 The Royals added a run in the eighth and one in the ninth, and had their second easy victory of the series." And it could hardly have come at a better time. After squandering their opportunity against Britton, the Royals would take full advantage of their opportunities against Darren O’Day and Brian Matusz in the top of the 10th, scoring three runs. Davis was credited with the win. And that, my friends, is how Wade Davis came to be known as The Cyborg.